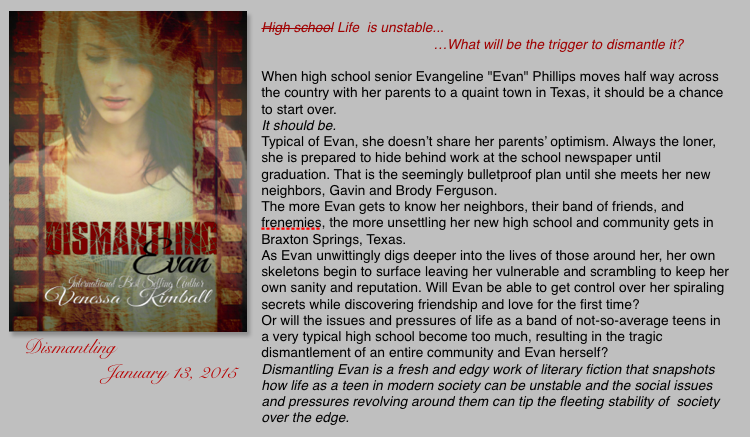 DISMANTLING EVAN—Not Your Usual YA! Here is Dismantling Evan’s breath-taking cover (SK Whiteside- you are amazing!) and the much awaited back cover blurb. Anyone that is a teenager, has a teenager, or was a teenager long ago will find themselves in the the pages of D.E. at some point. Evan’s snapshot of a not-so-average teen living with baggage in a very typical and sometimes intolerant society is not a typical teen contemporary novel. This is not a genre driven piece of fiction. It is most definitely a literary driven piece of fiction because of the social issues addressed in the novel. January 13th can’t come fast enough for me! squeeeeee! CLICK THE LINK BELOW FOR YOUR CHANCE TO WIN! Want to put D.E. on your To Be Read list on Goodreads? Want to contact Venessa Kimball ?